Well Tascam is releasing a standalone 24 track recorder that is also a 22 chanel mixer and interface with 24 channels to and from the computer. 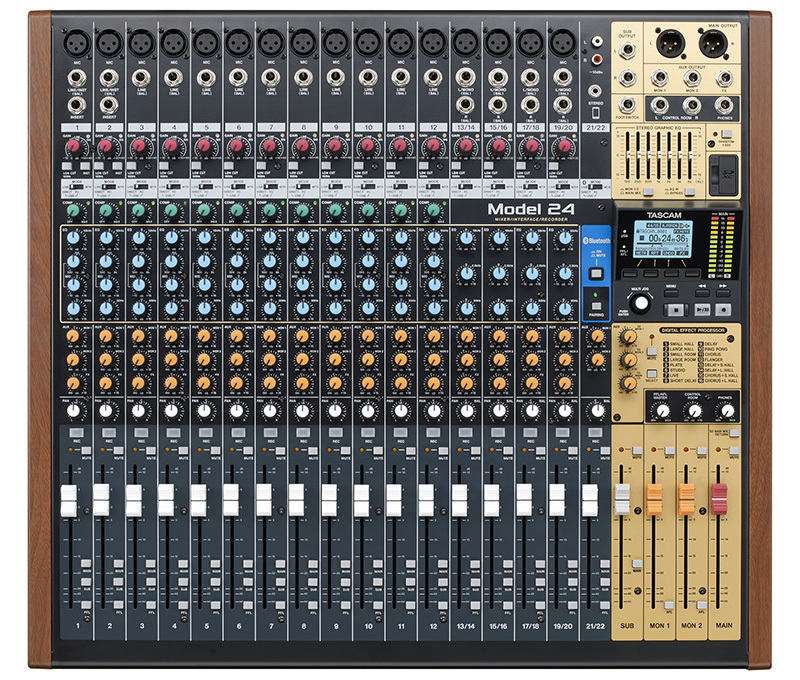 Tempted to get rid of my Soundcraft22mtk for this. Seems like a great way to record and mix with an all hardware studio and then do further editing in the computer if need be. It looks like it has a ton of potential and would be great for people using hardware. I think it’s screamingly insane that they left out inserts after the first two channels when they even have the empty blank space for them. That is pretty hot to be honest. I've got a Tascam SD-20M that I use as a 2-track (I just ignore the two mic inputs) and like the sound quality. I would buy a 4 mono + 4 stereo version of that in a heartbeat. I've always had good experiences with Tascam products. I like to hit record and just play. So, I like your thinking of record and mix, edit on the computer if you need/want to. There are times when I'd like to go back and do editing, even if it is just adjusting a level. Having all the stems would definately be nice. I wouldn't be suprised if they sell a lot of these. It is an untapped market. It's actually a very nice product at a great price. I'm not really tempted to buy products with cancer warnings on them..
Dont worry, your modular patch cables cause cancer too. Also, the internet. I saw that to about the cancer warning. Would like to know the specific products and what situations they emit harmful emissions, etc..
That’s a pretty lazy answer, especially given the cancer issues we deal with as a society. You would be naive to place the control into the hands of corporations. Would be better to discuss what is triggering the warning and put into proper context. dual RCA Bluetooth™ connectivity. This allows users to easily integrate mobiles devices into the mix for rehearsal playback, walk-in music and more. err.. OK. I guess there's a current marketing MO that you have to "integrate mobile devices" to be cool... but Bluetooth is garbage. Maybe that is the source of cancer. Thanks for the ad-hominem attack. Its pretty well understood that the california proposition has in fact caused great harm to the cause of product safety by applying a broad brush to a vast array of products which dont pose any particular risk. I even provided a link to a discussion of that, so you can educate yourself about P65. I apologize for the attack. Buy that article takes the position as I read we should disregard known carcinogenic fx of certain compounds (admittedly under certain specific conditions) for the greater good of capitalism. You indirectly attacked a group of individuals by suggesting their proposition was worthless and should be dismissed without getting to the real point, which is to see why the warning got triggered. It’s likely not an issue if used properly. I have seen how we handle radon, asbestos, and lead for example. We bury risk in the name of “job creation”, when rolling up our sleeves and understanding the risk would help with pragmatic risk reduction. This situation is worsening and personal to me. I looked very (very!) hard at this product, before going for the DP32SD instead. What made my choice for me was the observation that while the Model 24 will do recording, and audio interface work, and some overdubbing, that's about as far as it goes for editing. You need to have something else act as your mix/master tool if you want anything more than a live mix. By contrast, the Portastudio will let you mix, cut and paste, edit and undo, and even normalise your master track for you. Pop out the SD card and slap it in your phone, your computer, your music player and rock out, upload or whatever it is you do. This really defines the bright line between people who want the live mix and are happy to reshape something on the computer, and people who want a recording studio in one box. This isn't a criticism of the Model 24. As I said, I looked hard at it and was very tempted. It was simply no competition in the niche that the Portastudio serves. Cool mixer, but it’s missing quite a few basic things you’d need in a hardware environment. Obviously, they do this for cost cutting, so fair enough. But this is why these all-in-one mixer/interface set ups always disappoint me. I love the convenience but always end up yearning for more physical I/O. (Like inserts on the Sub, for instance and the aforementioned inserts on the channels). I wholeheartedly applaud the effort though. 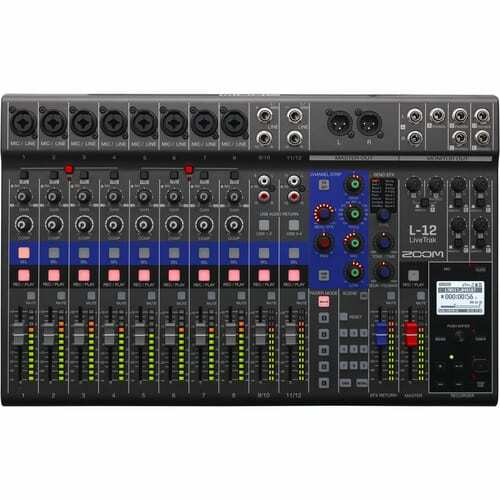 I was looking at this one too, but was concerned it may have the same mixing limitations..
wow,great stuff from Tascam (again)! Thanks, i appreciate it! I agree with your concern; the california law makes it impossible to get any useful information, so it just feedfs the ‘climate of fear’. I would guess from having read the Tascam that its the battery. To get back on topic though...the 48khz limitation and the 2 inserts kill it for me. I use inserts to get direct outs on desks not so equipped so I’d need them on all tracks to replace my mixer. My band-mate just ordered one of these this week. I'm curious to see how it fares compared to my zed R16 (which itself is about to be taken across the valley for some needed servicing). Anybody still using one, I read somewhere that they were having quality control issues ? This seems like such a good option, what am I missing ? Lack of inserts or mastering doesn’t bother me, I fully intend to just use the steams for samplers and the master as blueprint for the daw. Will the fx be usable , can you print them ? I'm using mine and enjoying it! FX are OK, but most of the board is useless to me since all the monitoring FX, EQ etc. are only recorded if you do a master mixdown, they are NOT printed to the automatic 22 individual wav files that are made every time you make a recording. That being said it's still great to finally have something like this after having a fair amount of modular, a few other synths ,and be able to just hear it all together and adjust the levels and record quickly. That's the way most mixers with direct out capability work. When you're multitrack recording, you want to preserve the raw, uneffected audio for each track so that you can go back later on and do a completely different mixdown of the song. If the FX, EQ etc were printed to the individual channels, you'd be stuck with them and the usefulness of having the stems would then be limited. Yes it’s the ability just to record takes easily so you can use them as blueprints for the daw that attracts me. Not having to power on a computer is great for just getting things going. I guess the fx are just there for live use if you need them, but you can always return from external into astereo channel. How is the latency on this ? That's kind of the whole point of it to me ,otherwise I would have just kept my RME Babyface Pro. Only recorded straight to SD card so far.